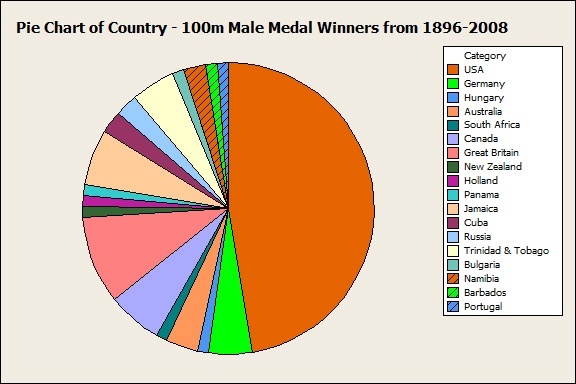 Men’s 100m Dash: How have the times changed over the years? As the 2012 Summer Olympics are now on in full “speed,” one of my favorite events to follow is the 100m dash. I’m a runner myself - although certainly not at the incredible caliber of Olympic athletes - and I’ve often thought about how running and sprinting has changed in the last 100+ years since the modern Olympic Games started. I was able to find the times for each male athlete medal-winner (gold, silver, or bronze) completing the 100m dash in the games occurring between 1900 and 2008, and with a little help from fellow blogger Jim Frost, we graphed the data using a fitted line plot (Stat > Regression > Fitted Line Plot). We excluded data from the 1896 Athens Olympics because it simply didn't fit the model, and runners at that time were still figuring out the fundamentals – such as the best starting stance. The 1896 games also had no official track, and the athletes were running in grass lanes separated only by ropes! However, from the second Olympics in 1900 through 2008, the data fit the model very nicely. 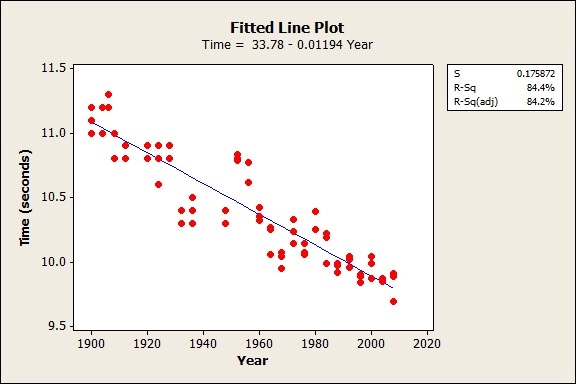 As you can see from the graph, the fitted regression line is showing a linear decrease, suggesting a constant downward trend for 100m dash times since 1900. The regression equation indicates that on average, the times decrease by 0.01194 seconds per year, or 0.04776 seconds over the years between each Summer Olympics. We can take the average annual decrease and calculate that it takes about 84 years to reduce the average time by one second for the top 3 male 100m dash finishers! Statistically speaking, there’s also a pretty strong relationship between time and year, which is indicated by the R-sq value of 84.4%. Another interesting point to make about this data is that we found no evidence that reductions in dash times are becoming smaller. It seems that over time the record should become harder to beat, and at some point you’d think that the line above would start to curve and flatten out as runners approach the absolute minimum time. However, there’s no evidence that dash times have reached this point. It raises a couple of questions: How much are the faster times due to the athletes themselves becoming faster versus improvements in equipment (shoes, track, etc.)? And how much longer can this trend continue before it starts to curve and flatten out? Now, to take things a step further, let’s see if Bolt’s Olympics 100m dash record has any chance of being broken this year. Rumor has it that Bolt will be attempting to break his current record! With General Regression analysis, Minitab calculates a fitted value for 2012 of 9.74670 seconds, which can be interpreted as the predicted average time for this year’s top three finishers. If we look at the 95% Confidence Interval for the prediction, we can see that the top 3 finishers in the final round will have an average time between 9.66856 seconds and 9.82484 seconds. And, if we construct an upper bound that equals the current Olympic record, we can say with 37% confidence that one finisher’s time this year will be less than the record. That’s not a stellar chance, but it is consistent with a runner breaking the 100m record an average of every 3 Olympics. Also, consider that this prediction is only based on the historical trend of the data and it doesn’t factor in any specific knowledge about this year’s race, or what type of gear Bolt will be running in, or on what type of track, or with what degree of audience distractions, etc., there might be better odds than the model suggests. So it appears that male 100m Olympic dashers have been getting faster over the years. Now, exactly why they have been getting faster is something I’m not so sure about. The faster times could be attributed to advances in technology such as the availability of lightweight shoes and clothes, or even new research on optimal diets and training plans for runners. Timing has improved and the development of starting blocks, which were first used in the 1948 Olympics, could also have something to do with the athlete’s ability to achieve faster times. It’s also probably safe to say that other Olympic events that are based on speed have seen a similar decrease in times over the years. There’s lots of Olympic event data freely available online, so feel free to use the analysis in this post as a model to analyze how Olympian performance in other events has changed over the years. Let me know what you find out! Has Figure Skating Improved? What Do the Numbers Say? Many thanks to Jim for his help with this blog post! 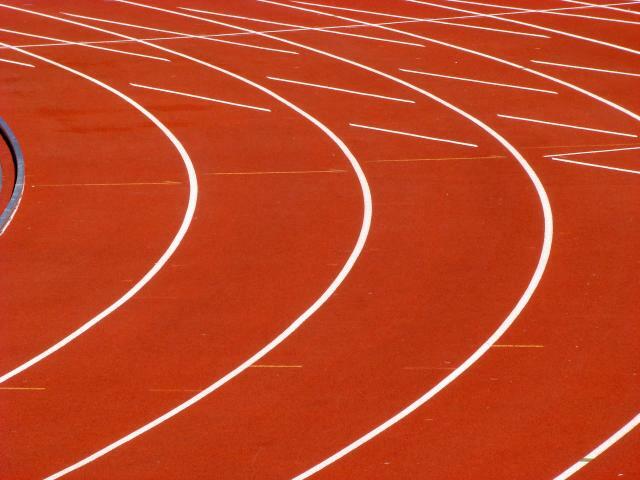 Track image used under Creative Commons Attribution ShareAlike 3.0 license.